both blocks can run at the same time. 2. navigate to Extensions -> Portal -> Portal Modules and click "Add Module" for any column and add Recent Active Topics (Top/Bottom) OR Recent Active Topics (Center) both can be ran at the same time on your portal. 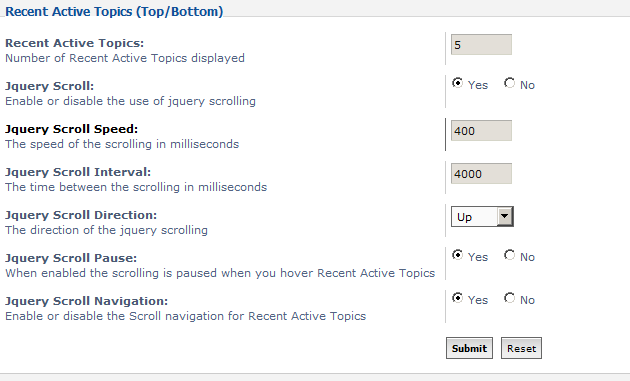 3. now configure your installed "Recent Active Topics" module to your liking by clicking on the . seperate css files and made responsive for both displays. middle block will hide the icon img to make block better fit middle module. i think this is a reported issue over on phpbb.com about 3.1.10 spitting out errors as it didn't clear the cache properly on extension install. if you clear the cache manually by deleteing the contents of "cache" folder but leave .htaccess AND index.html it should work. After installing this on my phpBB3.1.10 board I'm getting a HTTP 500 error. Could I please get some advise on how to revert the action of enabling this extension? As my entire website is down at the moment. Already cleared cache. That didn't help - also no access to ACP. what version of phpbb are you using? i made that module for 3.1.9 onwards so if yours is older it may not be compatable. also its a known issue that uploading extensions via FTP on phpbb 3.1.10 causes errors and the errors don't happen if you use an extension called "upload extensions" available from phpbb's extension database. j'utilise phpbb3.2 et le style prosilver et j'ai installer votre extension pour les topics recent. but I always have a problem of shift of the text in the cell. that occurs on all the style. can you provide a link to your site so i can look into it and also setup a demo account for me if i need to be logged to view the block.